Witches’ Night is an old tradition celebrated annually on the last night of April in many places in central and northern Europe including some Scandinavian countries. In the Czech Republic, Witches’ Night is known as “čarodějnice” which translates simply as “witches”. 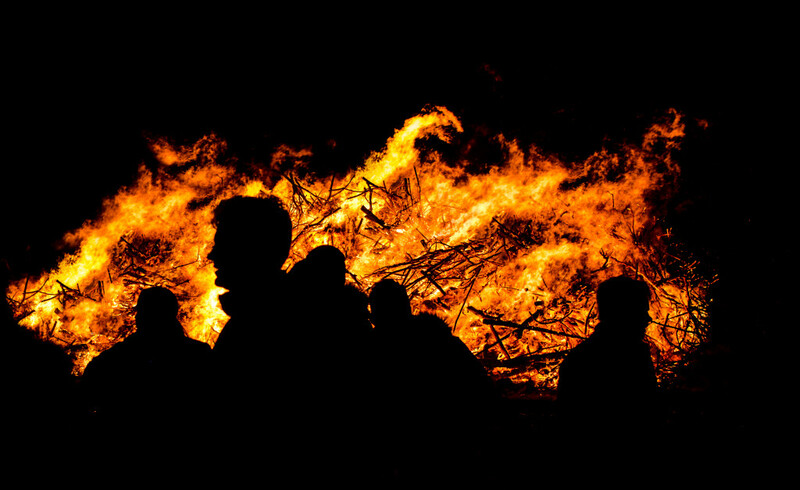 This is a night when townspeople and villagers all over the country gather together to burn enormous fires and frequently to consume enormous quantities of alcohol. The bonfires are frequently built on hilltops and other high places, often with children and young people spending a fair amount of time gathering materials during the day in order to construct the hugest blazes possible. Traditionally, midnight is the time for the lighting of the bonfires but, since Witches’ Night is often attended by families with children, sometimes the fires are lit earlier just after darkness has fallen in earnest and before the time when children are put to bed. Once the blaze is burning brightly, an effigy of a witch is thrown into the fire. Or sometimes the witch’s effigy is constructed on a tall pole with a crosspiece that is built into the center of the woodpile so that the witch’s image crowns the blaze. I’ve read or been told a couple of different versions of the historical significance of this tradition. One story maintains that it is the symbolic beginning of spring, and the burning of the witch represents the end of the old witch of winter’s icy grip on the land. 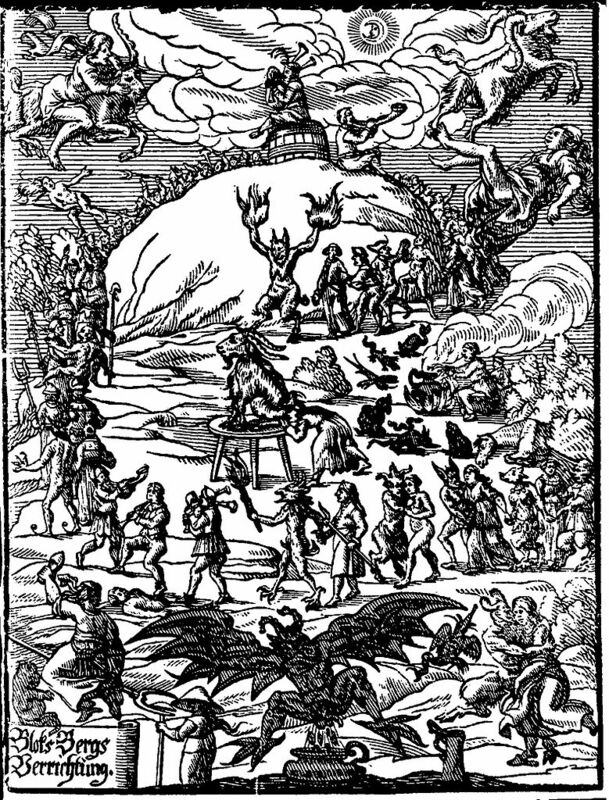 A different version holds that midnight on April 30th is the time of the annual gathering of witches and, when they are flying through the sky on their way to black mass, the smoke of the bonfires is meant to torment them and disrupt their evil activities as they pass overhead. Bonfires and broomsticks and bedlam and bawdiness. Whatever the truth may be, most sources agree that Witches’ Night has its roots in ancient pagan rites akin to the Celtic tradition of Beltane, possibly related to celebrations linked to the pagan fertility goddess Waldborg and the coming of spring. However, like many pagan holidays of eras gone by, Witches’ Night was co-opted by early Christians and turned into a saint’s celebration, the eve of Saint Walburga’s feast day. Saint Walburga was an English-born Benedictine nun (also known in Europe as Walpurgis, Waldburg, and Vauborg) who lived during the 8th century. Her father was St. Richard the Pilgrim, one of the kings of the West Saxons, who left his daughter with the abbess of Wimborne Abbey, Dorset, when he departed on a pilgrimage to the Holy Land. There she resided for more than two decades where she was educated by the resident nuns thus becoming an uncommonly literate for a woman of her time. Eventually, she was summoned to the Frankish Empire by her brother Winebald of Heidenheim in order to assist their uncle St. Boniface with the Christianization of the pagan Germans of Franconia. She became a nun at Heidenheim in the monastery founded by her brother, and upon his death sometime around 750, she succeeded him and served as abbess and leader of the monks and nuns there. She died in the late 770s and was interred at the monastery, but 100 years later her remains were transferred to Eichstatt on May 1st, which became the celebration of her feast day. Converted peasants of the Dark Ages all across Europe had a tendency to hold on to as many of their pagan beliefs as they could get away with without bringing down the wrath of the Church, and this was true also in the German lands. So one may suppose that it was only natural that these semi-pagans would incorporate the coming-of-spring celebration that had already been a tradition for untold centuries into the eve of the feast day of St. Walburga. And so it remains right up into modern times. “Walpurgis Night, when, according to the belief of millions of people, the devil was abroad – when the graves were opened and the dead came forth and walked. When all evil things of earth and air and water held revel.” – Bram Stoker in Dracula’s Guest.